What If The Legend of Zelda Made an Anime?! 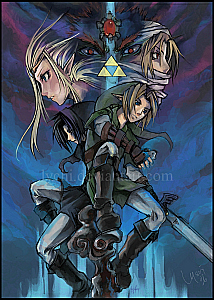 What if The Legend of Zelda series started an anime? I know the thought of Zelda being anything other than a video game strikes horror into the eyes of most fans thanks to the old cartoon featured on The Super Mario Bros. Super Show!. Some people are a fan while others are disgusted by the thought of the show each for various reasons. Lets just erase that from our memories and start new. 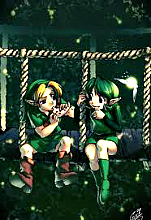 The Legend of Zelda series is known for its deep and amazing storylines that fans just can’t get enough of. So with such a huge fan base why doesn’t Nintendo expand off of the games and try making it into a movie or TV series of some kind? 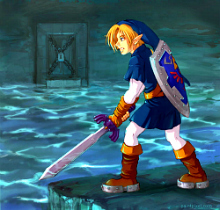 Many people feel that Link should not have a voice and if he did it would kill the character and ruin the story. Some people would prefer it with real actors while others feel the intensity and emotional aspect of the series would not be captured accurately in a live action film. So lets take a look at our other options. It has already had a semi successful series of manga, so how would the CG or an anime style work out for the Zelda series? Keep reading after the jump to hear my thoughts on the subject and a chance to add your own views. When people think of Zelda becoming a movie or tv series they automatically think back to the The Super Mario Bros. Super Show! or the fan film Hero of Time and how much of a negative impact they had and just try to forget the very thought while other people liked them just for the fact that it was Zelda. With that said people also seem to over look one extremely successful Nintendo franchise that has been creating fans for the past 15 years. Thats right, I’m talking about Pokemon. It has spawned 14 films, over 20 video games, 15 tv series, a very successful collectible card game and one of the biggest fan bases of any video game series. In my opinion the Zelda series could benefit from borrowing a few ideas from Pokemon. Releasing it as an anime or CG based tv series would be the perfect way to do this. When they released the cartoon I thought it had poor animation and poor acting, but that doesn’t have to be case this time around. They could easily find great artists and actors for the series and have an end result that looks as great as Final Fantasy Advent Children and borrow a storyline from one of the many games they have, like OoT or create an entirely new one. We can search Google or places like Deviant Art and find incredible and beautiful fan made artwork everywhere that would make a perfect art style for a tv series. So why has Nintendo not tried pursuing this idea that seems like it would be a gold mine for them? The only reason I can think of is when they mention Link is made to be a link to the players. If they think adding a voice to him would take away from that aspect than having him portrayed in a movie or series would kill it and many fans agree with this. In the end different fans have their own opinions on what direction the Zelda series should take, but what harm could a new tv series cause in the end? If you don’t like the idea than no one will force you to watch it. I think that Nintendo should at least give it a chance and have something like a poll for people to cast votes on. If it gets a positive response then they should consider it as an option. If Nintendo was to make a movie or a tv series what direction do you think they should take with it? Should Link have a voice? Should it be anime, CG or live action? What if it had an art style completely different like Skyward Sword? Leave us your thoughts in the comments below and remember to always check back for the constant Zelda updates coming in! Also don’t forget to check out our new Zelda Wiki and our Skyward Sword Story guide that Mases and everyone has been working hard on to provide you with the newest and most accurate Zelda news!